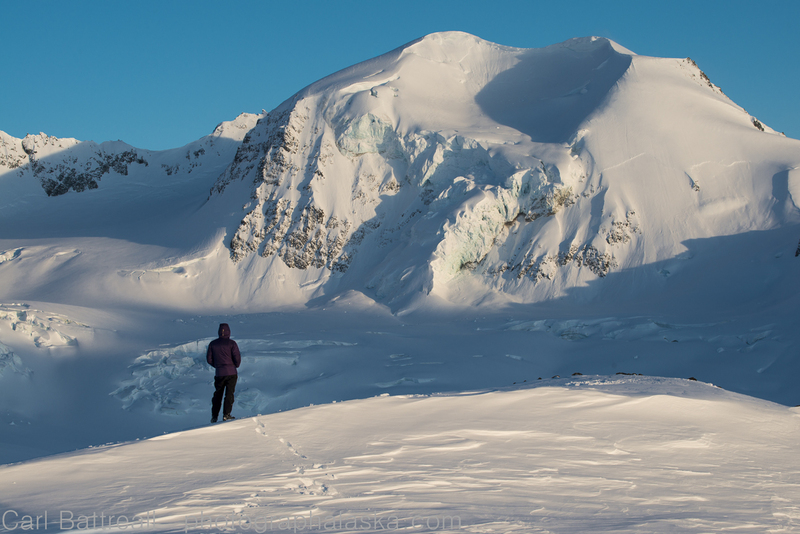 Brad enjoys the last light on the beautiful north face of peak 7680. “No flights today.” she said on the phone. This was our second day of waiting and our allocated time for adventure was slowly vanishing. We either had to give up on the trip or find an alternative. 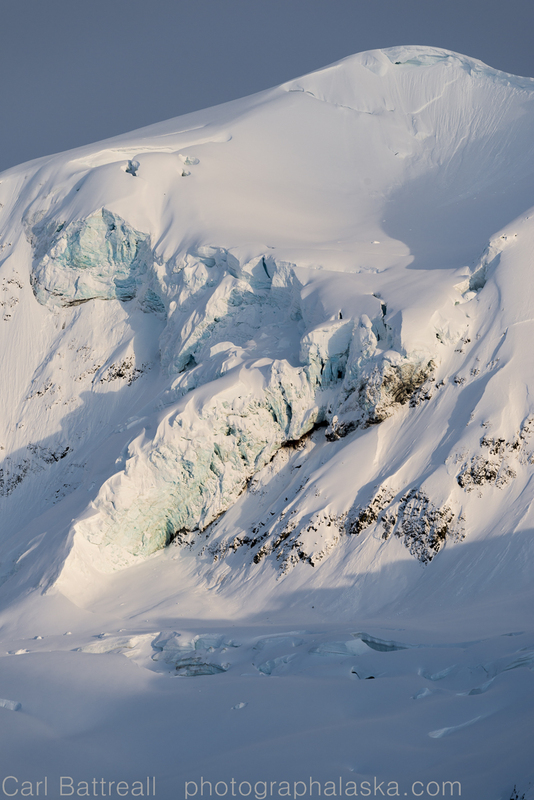 The central Alaska Range was choked with dense clouds and was getting pounded by high winds, there wasn’t much of a chance we would ever get to fly into the Eldridge Glacier, so if we wanted to salvage this trip, we needed to travel in on our own. I suggested one of my favorite places, the Delta Mountains. 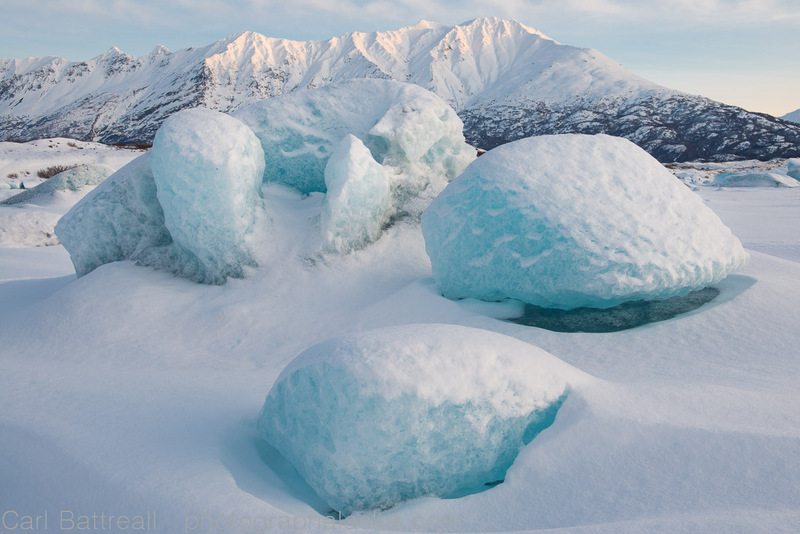 I had heard there was plenty snow and the area would be less crowded now that the infamous Arctic Man was over. 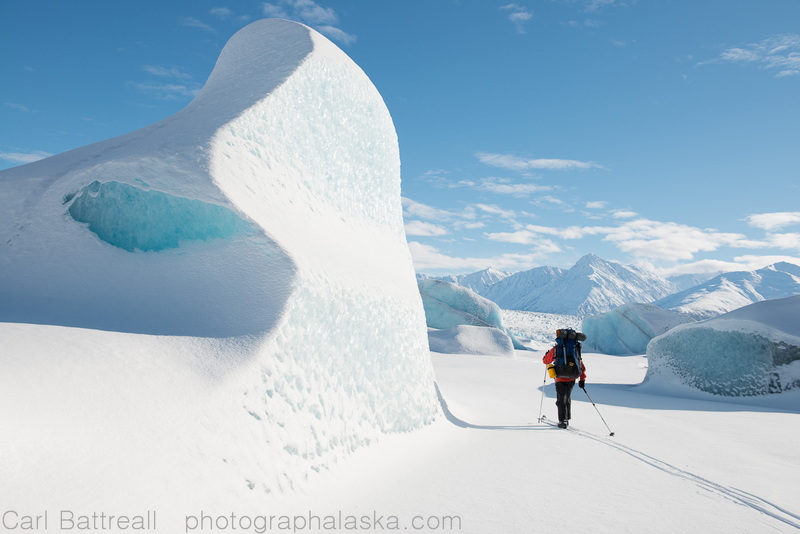 Neither Brad or Neil had ever been to the Delta Mountains, so it was decided, ski tour through the Deltas. The night before leaving Neil spoke with some USGS employees that had just returned from the Gulkana Glacier Research Hut and said there was a perfect trail busted and plenty of fresh snow. They also mentioned that the hut was unoccupied and that we were welcome to stay there a night or two. 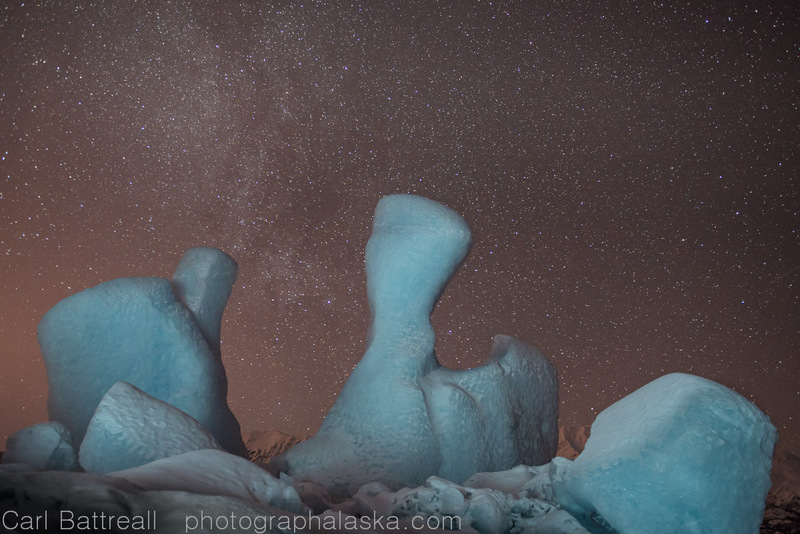 Monday we made the long, five-hour drive to the area known as the Hoodoos, near the toe of the Gulkana Glacier. 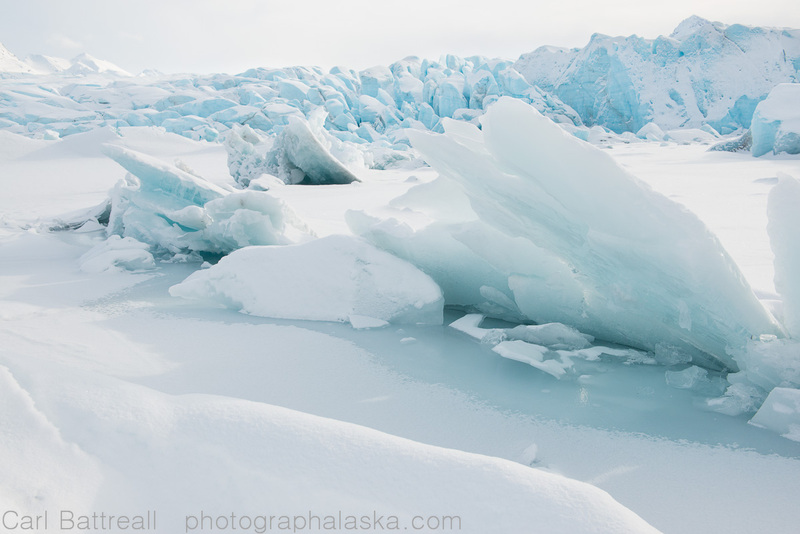 We drove up the plowed road that led to parking and camping area for the Arctic Man event. Under warm skies we loaded sleds and made quick up work up the river and then onto the glacier. 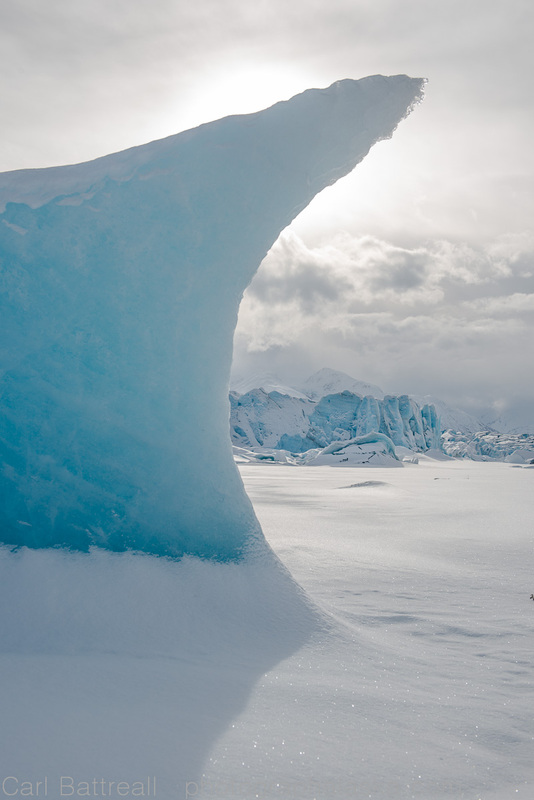 I had been (still am) suffering through a nasty groin-hip problem and after about four hours of dragging sleds up the glacier, my leg was ready to call it quits. Neil was blazing a trail and it took work for Brad and I to catch him. 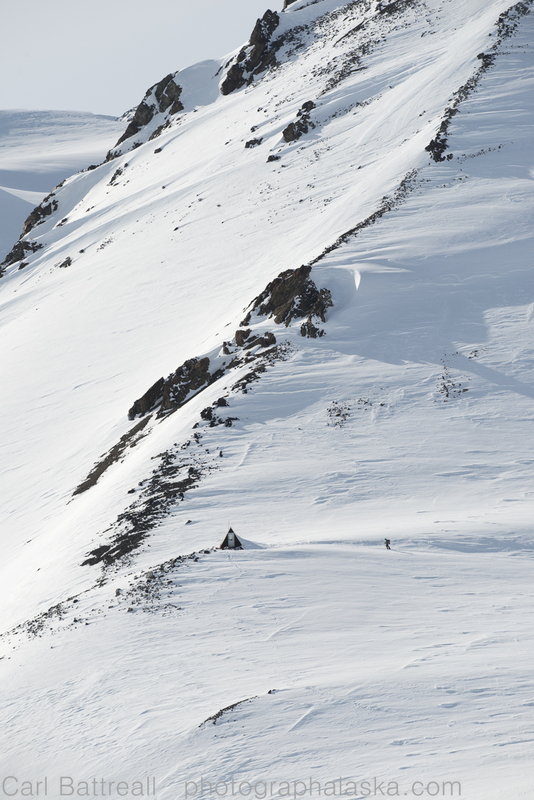 After some discussion we decided to put up camp above the lower Gabriel Icefall. By the end of dinner, the weather had begun to change, a stiff wind picked up and grey clouds drifted in. The next morning we woke to low, swirling clouds. We knew that the USGS cabin was about two miles ahead of us. It sat precariously perched on the bottom of a rocky ridge. We could occasionally see the ridge, but it would constantly disappear. The smart thing to do in those conditions, would be to hang tight and wait for an improvement in the weather. Purposely heading out onto the glacier, in whiteout conditions, would be an obvious lapse in judgment and yet, before I knew it, that was what we were doing. Guess you could say we had cabin fever. The siren song of an old, dilapidated structure was too hard to resist, so we pushed into the white void. The conditions gradually got worse. And like and man coming out of a coma I thought to myself, “What the hell are we doing?” I pulled out my compass and tried to get a bearing off the ridge that the cabin was on, but it was too late, it had vanished. Forced bivy. 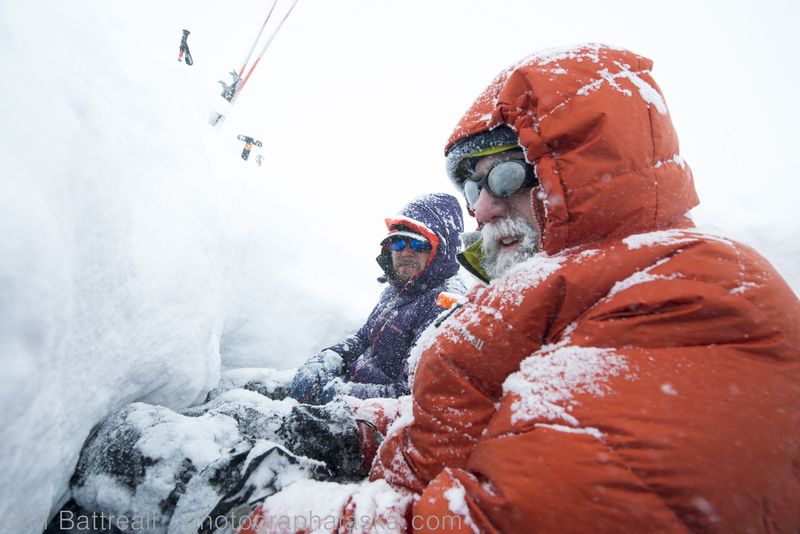 Brad and Neil enjoying our trench in the glacier. Being in a whiteout is a strange feeling, especially for the lead person. You have no reference, no idea if you’re on the edge of a cliff or on flat ground. Your mind begins to play tricks and you start to see things: rocks, bumps, hills, things that aren’t there. But your mind is so desperate to find something it recognizes, that it ultimately creates things.To your partners behind you, you look confused as you wanderer aimlessly. They have you and the rope as a reference, so they will constantly yell, “why are you going that way?” . This can all lead to tension amongst the team. 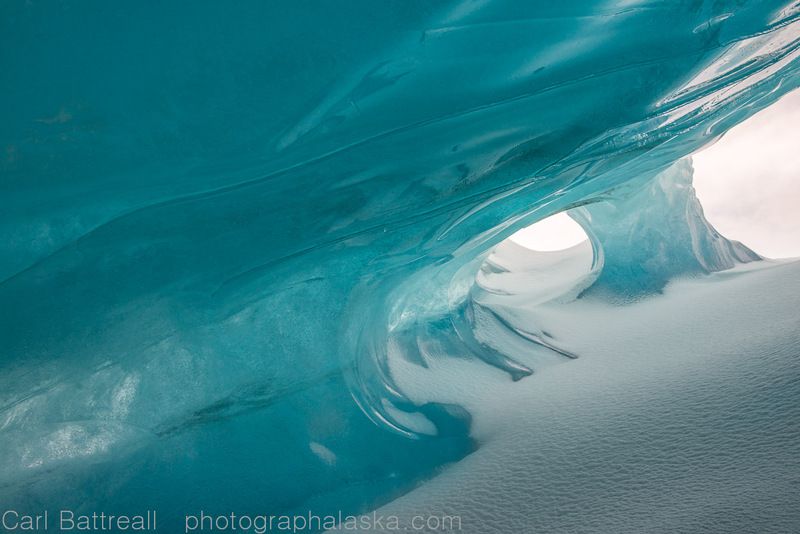 As soon as tensions began to rise, we got smart and stopped and dug into the glacier to get out of the wind and blowing snow. We decided to sit and see if things improved. If they didn’t in an hour or two, we would set up camp. Just when we started to get chilled and began to contemplate setting camp, the hut magically appeared. It was less than a quarter mile away, right above us. We quickly packed and made the slog up the steep slopes to the tiny USGS Hut. 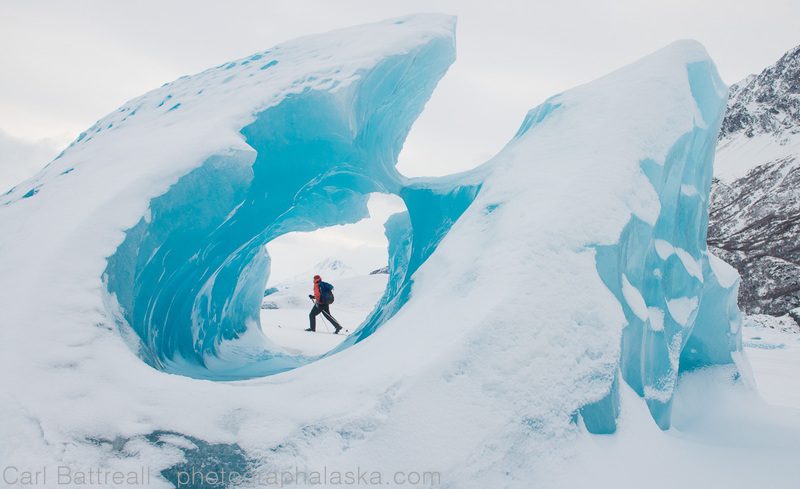 Neil approaches the Gulkana Glacier Research Hut after a long day of ski touring. 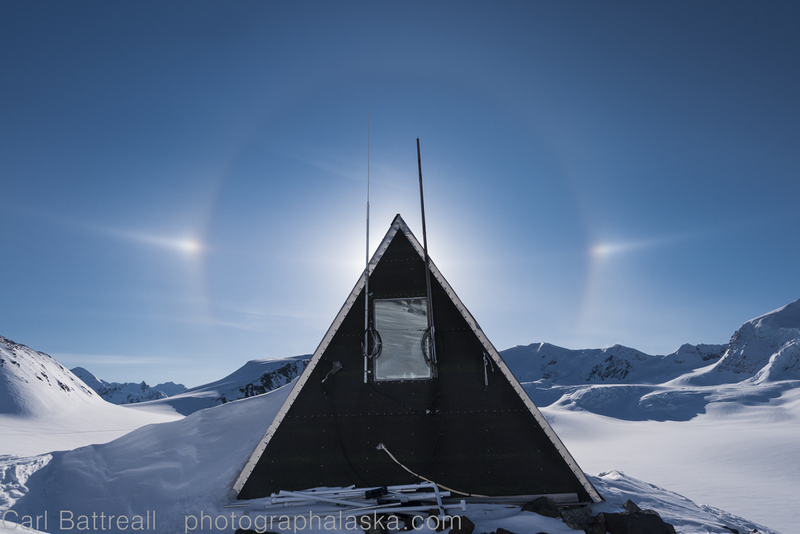 A rare, perfect sun dog and the Gulkana Glacier Research Hut. The USGS Gulkana Glacier Research Hut is used by both the USGS and the University of Alaska Fairbanks as a emergency shelter for scientist and students. It has room to sleep two, three if someone sleeps on the ground, which Brad graciously volunteered to do. Within a few hours the skies would clear and we would have four gloriously clear days in the mountains. We did have some high winds on the upper slopes, but it was hot when sheltered from them. 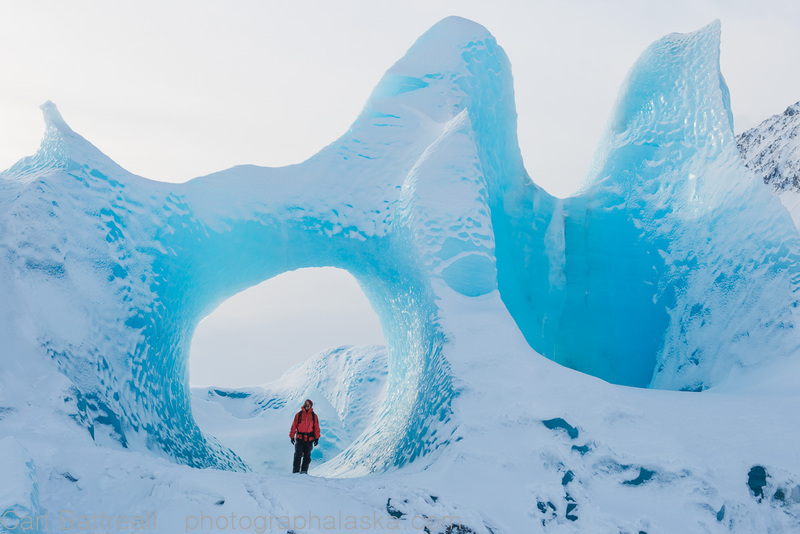 We spent two days exploring the endless ridges and icefalls that are scattered throughout the area. The skiing was perfect, six inches of thick powder on top of a stable, deep base. 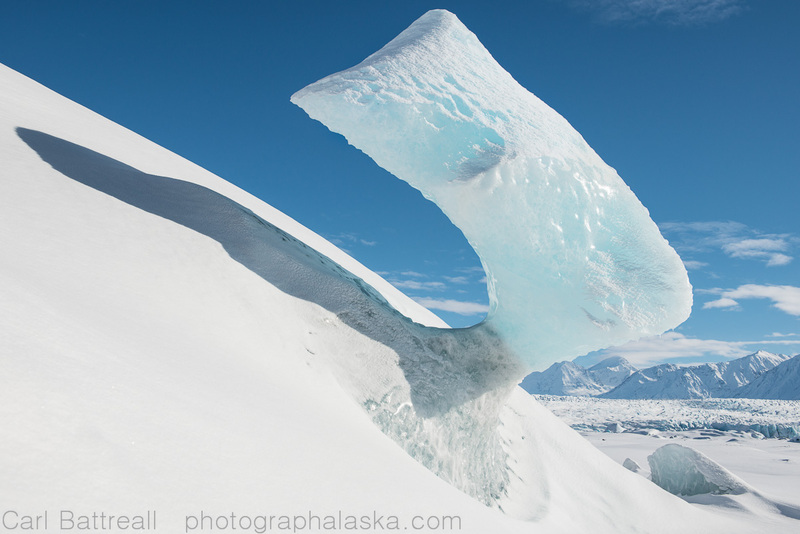 The amazing hanging glacier on the north face of peak 7680 dominates the view from the hut. I took one day off to rest my aching leg while Neil and Brad went bagging peaks. They had a fun time on steeps slopes and chunky, thigh burning powder. I never like to spend too long in one place so we finally said goodbye to our comfy little abode and skied down glacier. 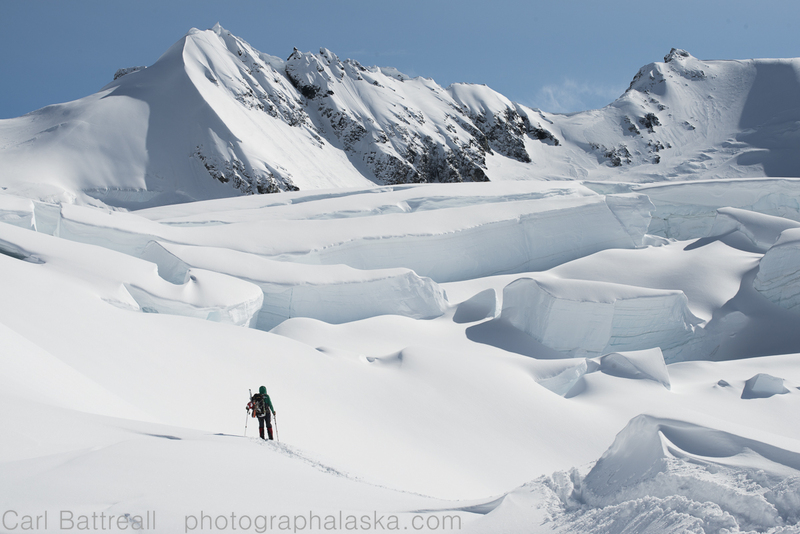 We explored the upper Gabriel Icefall and had a an amazing ski down, the hero snow made me feel like I was a good skier. 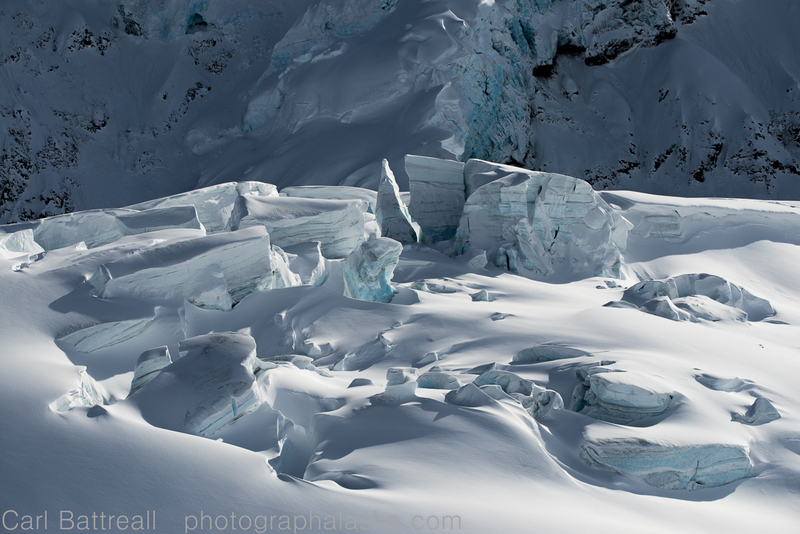 We put up our final camp at the base of the icefall. 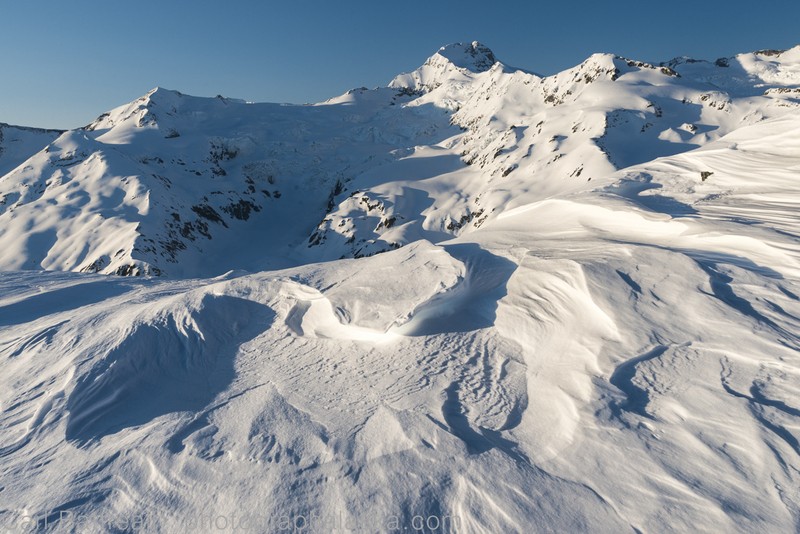 The final day was a brilliant ski on perfect snow, making turns with ours sleds, something that is rarely successful! 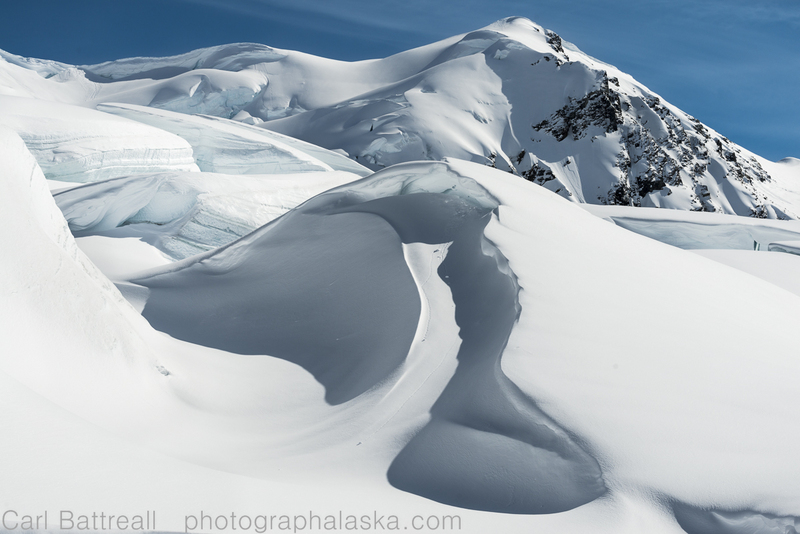 Firn crevasses, Moore Icefall, Icefall Peak in the background. 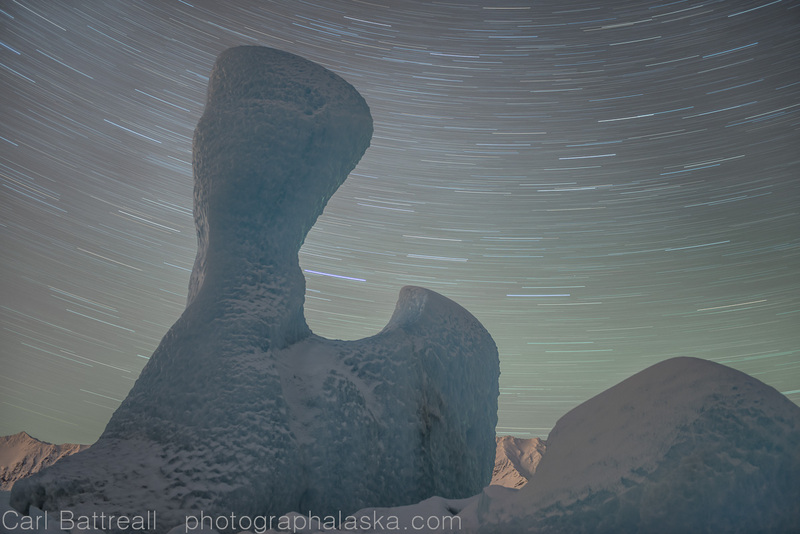 Strastrugi Formations and Snow White in the background. 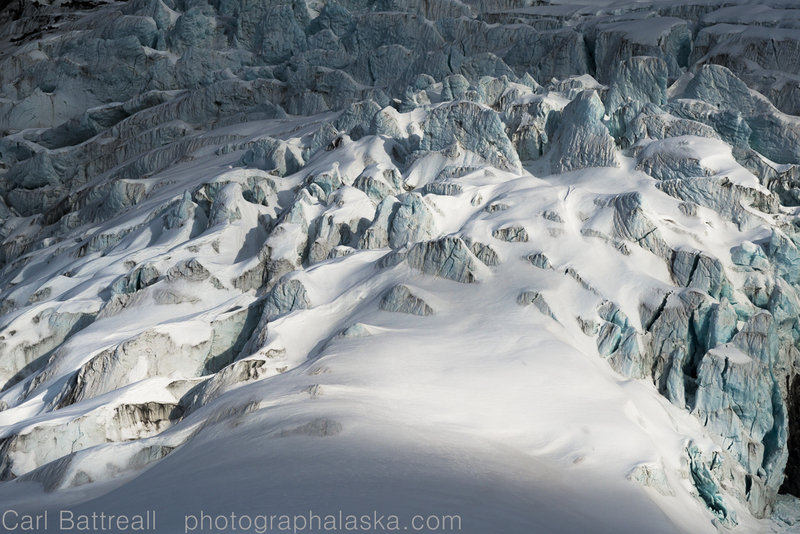 I was bummed not to get to the Eldridge Glacier, one of the only large Alaska Range glaciers I haven’t visited. 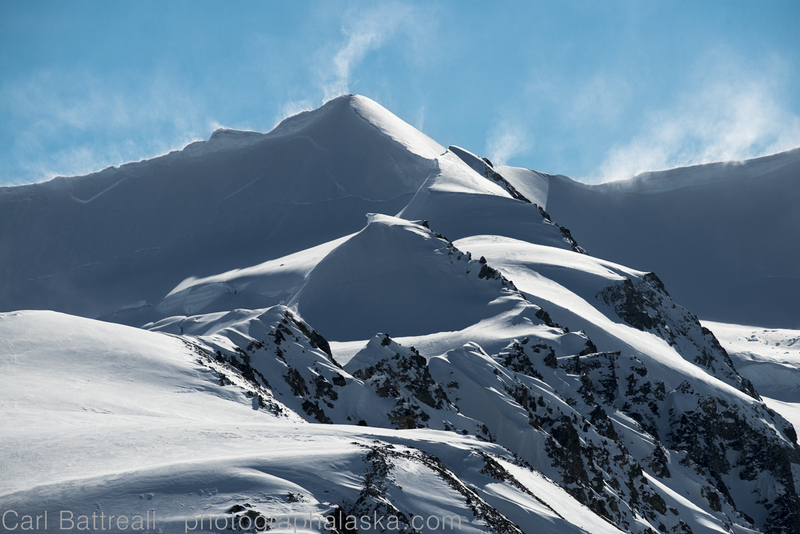 But is was a successful trip; great skiing and good friends in some of my favorite mountains in Alaska! High winds stayed with us most of the trip. 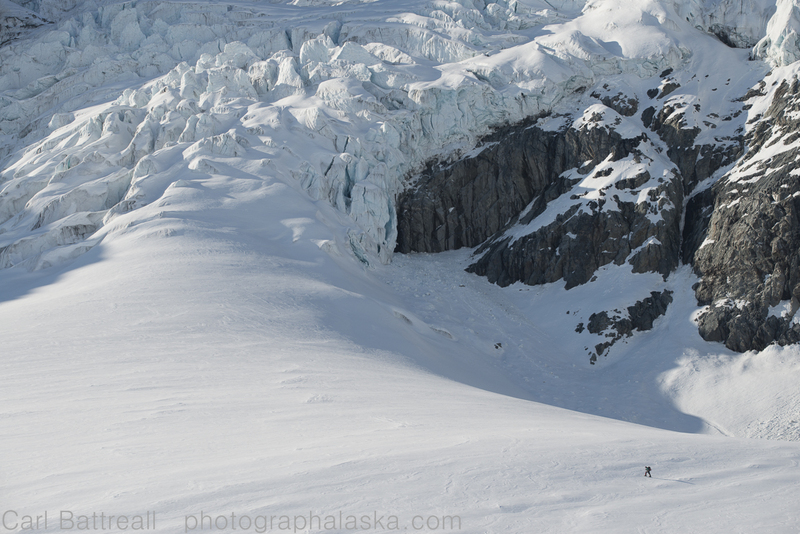 Neil skiing below the Gabriel Icefall. 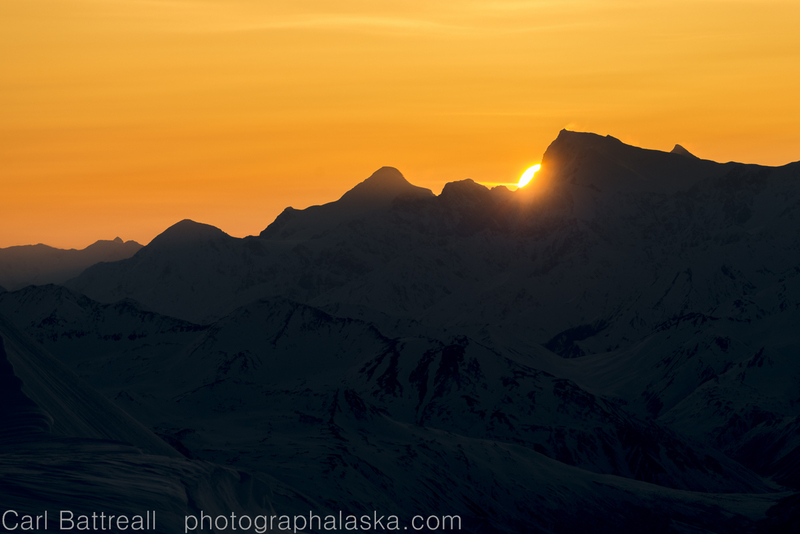 Sun sets behind Mount Shand. 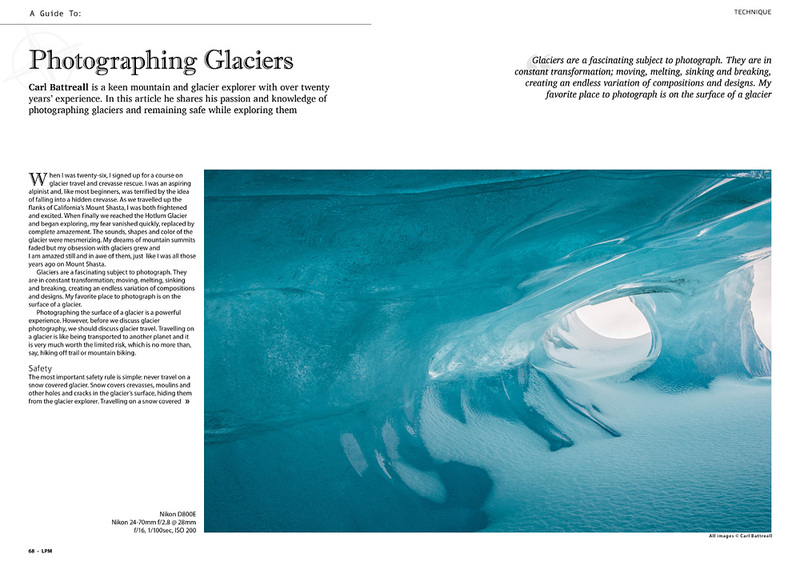 Landscape Photography Magazine has just published a new article I wrote on photographing glaciers.This was my first time working with Landscape Photography Magazine. 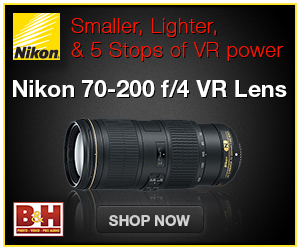 They are a high quality online European magazine that is worth checking out.